This paper will be published in Spanish in the Revista de Humanidades y Ciencias Sociales, Vol. 15, Nº 1-2 (June  December 2009). ISSN 1819-0545. Gabriela Aguilera Lizarazu studied Economics at the Universidad Autónoma "Gabriel René Moreno", and holds a Master's degree from the Pantheon Sorbonne University (Paris I) in International Economics and Development. The paper was written for the Summer School on Latin American Economies (ECLAC - UNITED NATIONS, Santiago de Chile), to which the author attended in 2009. (e-mail: gabriela.aguileralizarazu@googlemail.com). Translated by Jeremy Jordan and Nan Hyang Jordan. The objective of this paper is to analyze the challenges and opportunities that countries in South America are facing with the growth in the worldwide market of liquefied natural gas (LNG). Likewise, it aims to analyze, from different perspectives, the progress and setbacks regarding the interconnection of gas networks and the integration and cooperation of energy in the Southern Cone. This work comprises of five chapters. After the introduction and presentation of the subject, the second chapter analyzes the vision of predominant regional integration in Latin-America, the importance of political and economic interests, and the relevance of energy in regional integration processes. The third chapter describes the regional energy situation, its position in the worldwide context, the energy matrix conformation and the progress achieved in the integration and interconnection of gas. Chapter four provides details about the market tendencies of LNG around the world and in Latin-America, but also it presents the challenges and opportunities that each region has in order to strengthen their energy security. To finalize, chapter five presents conclusions and recommendations. In a context of important price fluctuations of petroleum, increased energy demand, insufficient production growth and consequently, lack of energy security, energy has turned into the central topic of many encounters between Latin-American governments. The worldwide growth of energy demand and the proximity of the peak price of petroleum, have opened horizons of uncertainty on the one hand due to the supply of this resource, and on the other hand have caused imbalances in the producing economies because of the vulnerability gained when facing such constantly changing situations. The role that energy plays in regional integration, within the worldwide context, and its future challenges to promote agreements of cooperation and energy security, is nowadays an important matter to deal with. Energy integration is understood as a process that leads to agreements of intergovernmental cooperation that favor infrastructural development for energy marketing, under a supranational regulatory framework that defines action mechanisms and provides security to its participants. The purpose of energy integration is to facilitate an access to energy to the majority of the population, and to serve as a legal and institutional base to advance towards processes of deeper economic integration. The development of interconnection of energy networks is a fundamental step towards the integration process, however, it is not the main aim. Greater energy interconnection does not always implicate joint energy policies. Therefore, it is necessary to establish a supranational regulatory framework that can uphold commercial agreements, signed among the countries, and that can define regional energy policies with the purpose of promoting energy as a right of all citizens. In the last few years there has been a substantial turn with regard to policies of deregulation implemented at the end of the eighties and the beginning of the nineties. Renationalization is a clear example of it. Hence, the purposes of integration as well as the main players who play a role in it are inclined towards a greater participation of the state in decision making regarding the development of the energy sector and the use of its resources. The political and economic crisis, together with other factors caused large problems to the supply of energy in the Southern Cone. Argentina, and above all Chile were the most affected countries, due to the reduction of their natural gas supply. Because of insecurity in the regional energy situation, certain countries were forced to look beyond their neighbors with the purpose of stocking up. Maritime projects of LNG placated this need. Only in Chile and Peru did the maritime plants reach a level of total investment of US$ 5,500 million. The maritime plant projects implemented and projected in the Southern Cone: 2 regasification plants in Chile, 1 plant in Argentina, 2 plants in Brazil, 1 plant in Uruguay and a liquefaction plant in Peru, all displayed a lack of joint regional energy policies. However, it is worth to point out the great efforts that the governments are making in order to ensure their energy supplies. The tendencies of the liquefied natural gas market beyond 2012 show a greater setting of growth in demand than the available capacity offered, which will generate a certain unbalance in the market. Therefore, it is indispensable again to take up the path leading towards the process of energy integration, under principles of cooperation and reliable legal frameworks, to ensure the supply of energy in the region. To talk about energy and integration policies, necessarily involves discussing the policies of regional development. However, these policies of development that delimit models of growth, are closely linked to the structural challenges within the region (poverty, social inequity) and the challenges of the region in the worldwide context. Traditionally, the vision of regional integration in Latin-America has been related to the issues of development and the insertion mechanisms of these countries into the global economy. Back in the sixties, integration played a key role in the policies of development. Under the Import Substitution-Industrialization (ISI) model, the fundamental function of integration was to expand the markets in order to enable a more efficient industrialization process. (Bouzas, 2009). Accordingly, new industries were protected and integration had to reduce high efficiency costs in small economies that were unable to reach a higher scale. The golden age of integration was the sixties. LAFTA (Latin-American Free Trade Association) was created in 1960; the Central American Common Market (CACM) was created in 1961, and CARIFTA, Caribbean Free Trade Association, was created in 1965 that later on, turned into CARICOM in 19732. Due to the framework of Latin-American Associations in favor of greater integration, the sixties turned out to be very dynamic. In 1980, the Latin-American Free Trade Association (LAFTA) fell into crisis. That year, the Treatise of Montevideo was renegotiated and the LAIA (Latin American Integration Association) was created, based on a more flexible approach and on bilateral agreements, hence breaking the wide ranged vision of integration. The political as well as the military context of conflicts in the region, in conjunction with the international crisis of the sixties debt crisis and exhaustion of ISI, resulted in policies of greater protectionism by some countries which lead to a decrease in trade flow. The original projects of regional integration were relegated. Towards the end of the eighties, the approach of integration in Latin America took a substantial turn away from the previous focus. This new approach was known as the "New Regionalism". From then on, the role of integration was aligned with a new paradigm of economic policies called "The Washington Consensus". In this sense, integration had the role of promulgating a more complete trade liberalization of the region for the worldwide economy, strengthening the North-South bilateral agreement between countries in the south and countries in the north or northern blocs. On a regional level, a loss of dynamism existed in the commercial blocs. There were serious problems of economic and social convergence in the blocs, no progress towards a greater integration and the political divergence was increasingly marked (CAN, Colombia-Venezuela) which prevented important agreements from being reached, to a certain extent. The North-South free trade treaties had taken preference over South-South agreements, without taking into account that both mechanisms strengthen the region and the countries since they are not substitutes, but complementary mechanisms3. With the approach of a greater worldwide insertion, countries had taken their decisions individually on participation in the external market. The notion of integration and its motivation in South-America are visualized and internalized by its inhabitants in a different way to those in developed countries. In the European case, at the time of creating the European Coal and Steel Community (1951), there was already a level of industrialization. The main objective was "to contribute, through the common market for coal and steel, to economic expansion, growth of employment and a rising standard of living"4. However, the Latin-American longing for integration was to reach higher levels of industrialization, to solve structural problems that had prevented a greater development and to manage a better position in the global market. The structural problems pertaining to Latin America such as insufficient and heterogeneous production, scant institutional and financial development, lack of endogenous technological foundation and extreme inequality and poverty, are very big challenges that only could be overcome through a regional consolidation, in view of a better political and economic insertion of the region in the worldwide context. (Tavares, Gomes, 1998). For this reason, a political and economic-historical analysis is required in order to comprehend the processes of integration in the region. Bela Balassa (1961), in his eagerness to give purely economic connotations, defined the commercial integration as "a process", or as a "state of things". In this way, the economic integration defined as "a process" includes several measures to abolish discrimination among economic units belonging to different national states. On the other hand, as a "state of things", integration represents a lack of various forms of discrimination among national economies. Some criticize such purely economic visions by classifying them as commercialist (Torres, 2004); others classify them as populist views with ideological tendencies. Nevertheless, in order to achieve integration of "state", the political will and economic interests will have to be combined in the "process", reaching an equitable optimization among its participants. Integration involves losing a certain extent of national sovereignty, but it also entails gaining benefits of the above-mentioned integration. During the sixties, integration played a strategic and indispensable role to accelerate growth, expand and diversify exports and to make progress towards industrialization, with a better use of economies of scale, advantages of specialization and industrial complementation. However, problems arose at the time of advancing from this first stage of industrialization towards a more dynamic model of growth. The constant and continuous loss of economic and political weight is a problem that can hold back joint regional development. The impact of the financial crisis on the economic and social situation, and together with new environmental measures for traditional exports from Latin America, led us to rethink about the need of a greater cooperation among the countries in order to work on an international level. Although it is clear that there are quite strong ideological tendencies in the region, it is necessary to coordinate policies of state with the goal of reaching joint regional measures. Economic integration cannot exist without a greater flow of commerce, reduction of customs tariffs and other difficulties related to foreign business, in the same way, neither a new form of regional economic organization can be established without political will and the conformation of consolidated transnational institutions with a regional long-term objective. The growth of worldwide energy demand and the proximity of the peak price of petroleum, open horizons of uncertainty, on the one hand due to the supply of this resource, and on the other hand because of the imbalance in the producing economies caused by vulnerability gained when facing a constantly changing situation. It is not by chance that the topic of energy has been present at meetings and summits for heads of states in the region. In April of 2007 the First South American Energy Summit took place, in which the South American Energy Council was created; in that same year, Bush visited Brazil during his "tour for ethanol" in order to make agreements on biofuel. Hence, during the Fifth Summit of the Americas that took place in Trinidad and Tobago in April of 2009, the importance of energy in the region was pointed out, and has been compiled in the "Energy Security" section of the Declaration of Commitment of the Port of Spain. The ideas and "proposals" of integration in Latin America contain substantial data, but it is worth to analyze the main role that energy plays in regional and international contexts by price fluctuations of crude oil. Following the mid eighties and the implementation of economic reforms, the private sector took on an important role in the energy sector, due to the privatization of several state owned Enterprises of Energy and Hydrocarbons. Accordingly, and with an external market of certain price stability, important interconnections took place for the transmission of energy between the countries. Could this be called progress of integration? The transnational energy interconnections through greater infrastructural construction for energy commercialization were guided by market interests and profit optimization. In this sense, there was no intergovernmental agenda that defined projects of integration based, not only, on continuing the development of energy interconnection, but instead based on much deeper and longer-term objectives of cooperation and energy security. The current outline is different. In the extreme context of the food crisis, price rises of petroleum as well as the financial crisis and political changes in the region, these have all served to instill a new situation in which energy, and the roles of Brazil and Venezuela, are important in the process of integration. During the Energy Summit of 2007, it was stated that "energy integration must be utilized as an important tool to promote social and economic development and the eradication of poverty". However, these great dreams contain large amounts of data. By viewing the role that energy plays in integration there are two proposals, the first brought about implicitly by Brazil, by means of its oil company PETROBRAS, and the other explicit proposal brought about by Venezuelan projects, through mixed agreements articulated between the PDVSA company and national enterprises of other countries on subjects of energy cooperation and the financing of access to energy. The first position tried to expand its hegemony in the traditional style of integration; the second one tried to give "alternative" ways by putting emphasis on cooperation before maximization of economic utilities, but emphasizing the role that energy plays in order to gain political hegemony. Another difference lies in the causes of expansion of these enterprises. PETROBRAS expands and diversifies its energy matrix mainly in order to supply its internal market. However, the Venezuelan government uses it to expand its ideology among the nations. It is true that we are far from reaching energy integration, and the progress that has been made towards a greater interconnection, is at a standstill. The role that it is being given to energy exceeds its own limits, forgetting about the most basic objectives: to secure the regional supply and allow a greater access from the population, through the progress of energy network interconnections. It is necessary to combine long term integration projects, under a transnational framework of commitment and cooperation among the countries, with short term projects that are able to carry out the objectives proposed at important meetings on energy and presidential summits. In order to begin with our analysis it is important to locate Latin America and the Caribbean (LAC) in the worldwide context, to know what is its importance in the framework of global energy policies, as well as to identify the main players in the region. Petroleum LAC: The Latin American and the Caribbean reserves of petroleum represent 10% of worldwide reserves, Venezuela being the one with the largest reserves in the region, representing 68% of the regional total. Mexico might turn into a net importer of petroleum by 2020 if it follows this production tendency. The refining capacity of petroleum in Latin America is of 7,149 thousands of barrels per day (Kbbl/d) of petroleum, Brazil has a production of 28%, and Mexico and Venezuela when added together represents 68% of the regional refining capacity. Part of the accelerated growth of natural gas demand has to do with its use in electricity power generation as a substitute for other previously used energies (petroleum, hydroelectric power). The largest proven reserves of natural gas are owned by Venezuela. Nevertheless, almost 90% of its reserves are gas related, which implies their relationship to petroleum production. According to ENAGAS, petroleum production consumes 70% of the total with the purpose of helping the extraction of crude oil. Mineral Coal LAC: The participation of mineral coal is the least relevant on the worldwide level. Brazil counts with 75.16% of the proven reserves, but the country with the highest levels of production (73.16%) is Colombia. Hydroelectricity LAC: Within the primary energy supply, it is worth pointing out the participation of hydroelectricity (11%). Its production can be summarized by Brazil, Venezuela, Colombia and Argentina, which generate 86% of hydroelectric power on a regional level. In 2005, Latin America and the Caribbean had produced 22% of worldwide hydroelectric power. The global trade of natural gas has increased substantially starting in the year 2000, from approximately 530 billion cubic meters (BCM) to 900 BCM in 2008. This tendency has been noticeable in the region due to different factors: an increase on the side of supply, greater discoveries, higher investments which were accompanied by reforms that attracted foreign capital, as well as on the side of consumption, both in the residential area and the use of this energy resource for electric power generation. According to EIA, the consumption of natural gas will increase by 2.4% per year between 2006 -2030, and in the specific case of Brazil, the consumption by 2030 will double that of the year 2006. As it was pointed out previously, many countries are incorporating more and more natural gas in electricity power generation, with the aim of diversifying their sources of energy, which are based fundamentally on hydroelectricity, and at the same time reduce the utilization of expensive fossil fuel (petroleum). According to EIA, natural gas is estimated to be the second most utilized energy in electricity generation with the highest growth rate. However, hydroelectric power will maintain its first place. For this reason, it is very important to raise a sustainability analysis under social and environmental approaches for this source of energy. The dynamics of the natural gas trade, including LNG, seem to create a future scenario of price rises due to high demands driven by the supply capacity of the producing countries. This new panorama raises certain warnings for those countries which lack this resource and are looking for alternative energy. There are different initiatives of energy cooperation and hydrocarbon supply, among them can be found: a) The Petroamerica Initiative (Petrocaribe, Petroandina, Petrosouth); b) The Mesoamerica Energy Integration Program; c) The Integration Agreement of Cooperation signed by Cuba; d) The Energy Ring; e) The Southern gas pipeline (Ruiz, 2006). The process of regional energy integration up until the nineties was scant and focused on bilateral electricity interconnections and on a gas structure developed mainly by Argentina, Bolivia and Chile. The construction boom of international gas interconnections occurred during the mid nineties. It is calculated that between 1996-2003 gas infrastructures increased by 72% and production by100%. The deregulation reforms in the energy sector and the privatization of state owned petroleum enterprises motivated an increased level of investments. The "South American Energy Ring" (AES) project was comprised of an infrastructural connection by private initiatives, and encouraged by some governments, in order to ensure sufficient gas supply in the region. At first, the cooperation by Argentina, Chile, Brazil, Peru and Uruguay was considered, and later the possibility arose to include Bolivia and Paraguay. One of the motivations of AES was to create an institutional framework in order to bring investments into the energy sector that at the time were scant. Therefore it was indispensable to create a suitable legal arrangement and a predictable industrial regimen. Specifically, the project did not make much progress in real terms although it had plenty of publicity support. The seven governments never got to negotiate together. One of the technical obstacles regarding the viabilities of this project was the lack of proven reserves of the first supplying country, Peru, which implied that the project would have to be carried out with the involvement of Bolivia. However, the latter was going through social upheavals, political crisis and awareness of a coup d'état. Therefore, faced with this discouraging scenario for investments, there was no way to continue with the project. On the other hand, it is worth mentioning that the lack of a regional vision of cooperation with regard to energy was noticeable. In the region a tendency of integration proposals exists that is based on political agreements, prominence of the state and components of cooperation. The incompatibility of this project with the vision of regional integration by some governments from the Southern Cone, failed to give it legitimacy, although it is necessary to mention that the project was economically rational, but unsuitable for the political climate at that time. The AES project could not be approved at the MERCOSUR Presidential Summit, which took place in December of 2005. 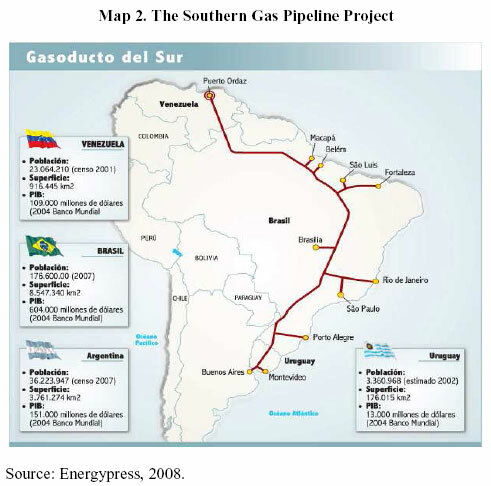 In December of 2005, after Venezuela joined MERCOSUR as a full member, the governments of Argentina, Brazil and Venezuela signed a memorandum of understanding in order to proceed with feasibility studies for the Southern Gas Pipeline construction (Ruiz, 2006). The shortage of supplies in Argentina and repercussions in Chile, together with the political and social upheavals that Bolivia was going through, and that Brazil's rather large market needed to be stocked up, made the project at first glance seem quite interesting. 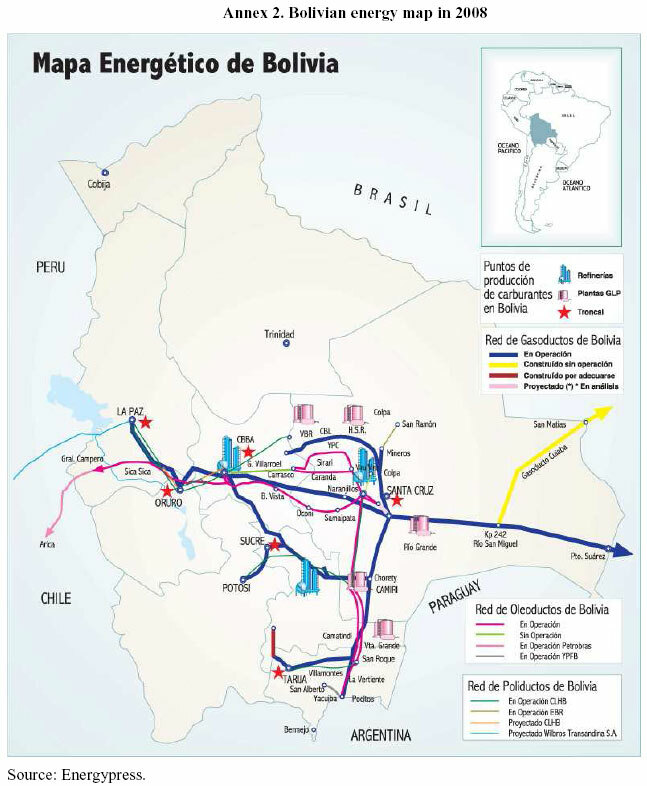 The SG project was based on constructing a large gas pipeline that would unite Puerto Ordaz with Brazil, and reaching Buenos Aires (See Map 2). This infrastructure would have an approximate extension length of 8,000 Km. This large gas pipeline proposal would have required an investment of 23,000 million dollars and could have transported 150 MMm3/d. Hence, this construction project represented an economic interest, if not as the Venezuelan President stated, political interests under the framework of cooperation between the Bolivarian states. To the best of intentions, the project was economically and technically unviable. One of the limitations of this project was focused mainly on the true capacity of Venezuela to supply the needed amount of gas. A large proportion of its gas reserves were associated with petroleum production. Only 10% of proven gas reserves could be found in deposits of free gas (Kosulj, 2008). The energy integration initiatives of the hemisphere were defined in the Plan of Action of the First Presidential Summit of the Americas (1994), the objectives of which were to create "Free Trade in the Hemisphere". In this sense, regional energy cooperation and the development of policies that could facilitate private investments in the sectors were being stimulated. The main promoter was the United States, the world's largest consumer of petroleum (Ruiz, 2006). Reforms in the energy sector, made in ALC during the nineties, promoted the vision of the Summit of 1994. Under the notion of inefficiency of state owned enterprises, these were capitalized and privatized, changes were made in the contracting system for upstream activities and the entry barriers to downstream activities which were liberalized, among other reforms (Ruiz, 2006). 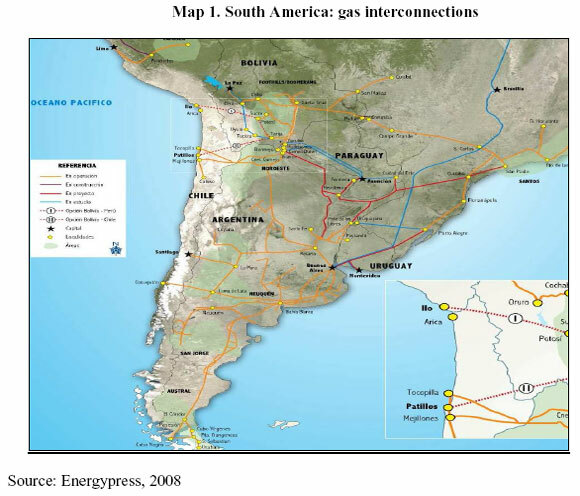 However, the gas interconnection process in the Southern Cone went into a crisis in 2004. A set of factors such as devaluation in Argentina, supply restrictions against growing demand, changes in the crude oil price situation and political changes that were taking place in the region, weakened the progress of further construction of infrastructure. Accordingly, the energy crisis became increasingly deeper, especially in Chile (Kosulj, 2008). The visions of integration that are currently being pointed out by some governments are contained within the idea of cooperation between neighboring countries, contrary to integration visions at the beginning of the nineties, which favored the participation of private enterprises. According to Ruiz (2006), the Petroamerica Initiative is a clear example that "the character of energy integration organized only by the market, has been replaced by one in which the state has a more active participation." (p. 23). According to the Declaration of Caracas,9 the progresses made in energy integration are acknowledged and the PETROAMERICA Strategy is considered to be helpful in the identification of mechanisms of cooperation and energy integration, acting as a geopolitical authority among the states. In the same way, in order to safeguard interests of the nations and autonomy in the management and utilization of their own energy resources, the right of the people to sovereignty is enhanced. In this way, Venezuela is playing the main role in integration agreements, as is shown by its bilateral agreements of cooperation with Brazil, Argentina, Uruguay, Paraguay and Bolivia. By the beginning of the year 2000, large changes were already being expected from the role that Liquefied Natural Gas would play in the gas industry and in the global energy market. The combination of high prices of natural gas, low costs of LNG due to technological improvements, increased gas demand, and the desire of the producing countries to monetize their reserves, incentivized the making of new projects with the purpose of intensifying the LNG trade. Accordingly, the distance that exists between producing countries and the large consumer market has encouraged these projects in order to supply growing demands. According to Andy Flower10, transporting LNG by means of ship is cheaper than by gas pipeline when the distance is equal to or greater than 2,000 Km. for offshore pipelines and around or above 3,800 Km. for onshore pipelines. In the following chart, a substantial increase of LNG consumption compared to the total world gas consumption starting from the year 2003 can be observed. The new liquefaction plant projects of regasification, and the joining of Russia into the market, might maintain this growing importance of energy trade. Exporters of LNG: The LNG market is comprised of the following zones: the Pacific Basin, the Middle East and the Atlantic Basin. In the year 2002, the Pacific Basin produced 2.6 trillions of cubic feet (tcf), which represented 49% of the total production. Among the producing countries were Indonesia, Malaysia, Australia, Brunei and the United States. The Middle Eastern Market (Qatar, Oman, UAE), produced 1.2 tcf, which represented 23% of the total production. On the other hand, during the same year, the Atlantic Basin had a production of 29%. Among the producing countries from the latter were: Algeria, Nigeria, Trinidad and Tobago, Libya, Egypt and Norway. In 2007, the exporting matrix was diversified with the participation of new players in the market. Exporters from the Middle East supplied 25% of LNG to the world. The Pacific Basin represented 39%. Regarding the Atlantic Basin (36%), the new liquefaction projects, mostly in Trinidad and Tobago, and the joining of Nigeria in 2002, entailed a greater participation of these countries in the LNG market. 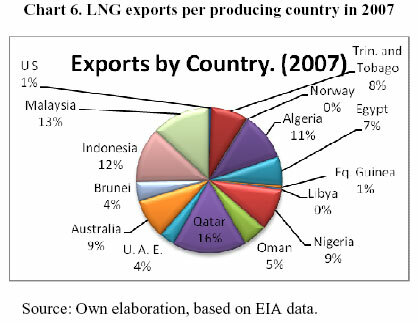 Qatar: In 2007, Qatar was the largest LNG producer in the Middle East and the world. This could be consolidated since it is carrying out programs to increment its production capacity from 30 millions of tons per year (MTY) in 2006 to 77 MTY in the next years. The increased production capacity of Qatar could modify the markets and affect price levels. According to the Goldman Sachs Group Inc., the price of LNG will tend to fall by the second half of 2009, due to the supply from Qatar and a low demand for fuel from Japan. Moreover, it would be necessary to add to the expected supply those from other countries like Indonesia and Yemen. Malaysia: In 2007, Malaysia was the second most important exporter in the world, with an export level of approximately 1 trillion cubic feet (tcf), which represented 13% of the world total. The three main consumer markets were Japan, South Korea and Taiwan. PETRONAS, National Petroleum Enterprise controlled 62% of MISC (Malaysia Shipping Corporation) which was in charge of transporting LNG by sea. New Producers: It is expected that Angola, Iran, Yemen and Peru will enter the market in these immediate years. Russia entered last year, with the culmination of its first LNG plant on the Island of Sakhalin which has an annual capacity of 4.8 MT. It is one of the largest integrated projects in the world that will allow the Russian Federation to innovate in technology for offshore production. Russia has, for the moment, its main market in Japan. The first shipment left in March of 2009. Angola is waiting to be incorporated into the market in 2012. The first LNG plant has an investment of between US$ 8,000 and 10,000 million. Its main markets will be the United States, Europe and Asia. Iran has intended to start exporting 2.5 MT of LNG in 2010, a number that will increase gradually up to 10.8 MT. Its markets of interest are Europe and China. (MCF) per year. At the moment, the United States and South Korea will be its main markets. Importers of LNG: By 2002, twelve countries were importing LNG. Moreover, in the last six years six more countries joined in, among them India (2004), China (2006), Russia and Great Britain. The main LNG buyers are the countries belonging to the Pacific Basin (Japan, South Korea and Taiwan). In 2001 the purchases of these countries represented 71% of the total imported. Due to new countries joining the market, the considerable increase of demand from the United States, and the expansion of the LNG market, their participation in the international market decreased to 66%. Japan is the largest LNG importer. By 2002, it represented 48% of total imports. Natural Gas covers 12% of its energy demand and more than 95% of that consumption is LNG. The electric power sector is the largest consumer: 61% of the total LNG consumption in 2008, according to EIA Data. South Korea is the second most important LNG buyer and one of the four most important petroleum purchasers. Due to its lack of energy resources, it depends very much on the external market. In 2007, it attained dependence on external energy of 96.7%. Its main suppliers are Indonesia, Qatar and Oman. Although it is intending to diversify its energy matrix, by stressing investment in R&D in order to develop nuclear power and renewable sources, Korea will continue having high rates of dependence. Korea has liberalized (although not in its totality) its energy sector and the company KOGAS has lost its monopoly. The contracts operated by Korea are focused on searching for a greater flexibility regarding them. Another market that supposedly will have influence is China. Gas consumption from 2003 to 2005 has grown with an annual average of 30%. China joined the LNG market in 2006, and although its LNG imports have grown 15% in 2008, mainly because of the Olympic Games in Beijing, it is expected that by 2009, the amount will not be increased, nor be reduced. For the medium term it might be hard to plan that South America will become the first energy power of the world; however, the prospects for Brazil are favorable. Brazil is the tenth biggest energy consumer (2008). Its consumption growth is explained by its sustained economic development. It is for this reason that the development of the energy sector, greater diversification of the kind of energy used with emphasis in the incorporation of renewable energies, is a long term goal that is being achieved through state policies. In 2006, petroleum consumption represented 46% of the total energy consumed, while natural gas reached 7%. Nevertheless, the rate of gas demand growth has increased considerably from the year 2000. The provider countries of this energy are Bolivia and Argentina. The growing demand for gas together with the lack of trust towards Bolivia as a provider motivated the construction, in record time, of two regasification terminals: Pecem Terminal located in the north and the Guanabara Terminal in the south of the country. For that purpose, Brazil has hired regasification ships under two biddings gained by the company Golar LNG. These ships have the technological capacity to store and regasify on board. According to Golar LNG, the industry estimates that floating storage unit (FSU) technology is advantageous since it is 50% to 75% cheaper than others.13 For that reason the demand of both OECD and non-OECD countries, have chosen this technology. Pecem Terminal is capable of regasificating 247.34 millions of cubic feet per day (MCF/d). It received its first shipment in July 2008 from Trinidad and Tobago. On the other hand, Guanabara Terminal is capable of regasificating 494.4 MCF/d. According to ANP, the total amount of LNG received during 2008 reached 1.3 BCF coming entirely from Trinidad and Tobago. Although this implies a greater LNG supply, Brazil will not stop importing gas from Bolivia, at least not until the culmination of their contract by year 2019. The main LNG objectives are to supply its thermoelectric companies for electricity production. In this context, with the progress achieved in the energy sector, it seems that Brazil will play a fundamental role in the geopolitics of energy in South America and that its regional hegemony will be consolidated. entrusted the state owned enterprise ENAP with the regasification plant project for LNG supply. In June of 2009, Quinteros Plant received its first LNG carrier "Jane Elizabeth" from Trinidad and Tobago to start the functioning of its operations. Approximately 8 weeks later, another methane tanker arrived, "Methane Rita Andrea", with 145000 m3 of LNG coming from Egypt, destined for commercial operations. The regasification plant Quinteros counts with an investment of US$1,100 million. The project Mejillones is represented by the copper company CODELO and GDF SUEZ, each with a 50% participation. The objective of the plant is to supply the main mining enterprises of Big North with electric power. Contracts have already been made with the Northern Codelco Division, Escondidas from BHP Billion16, ABRA and with Collahuasi. Faced with a situation of uncertainty regarding Argentina's energy supply, and its heavy dependence on natural gas, LNG projects used to be part of the solution. In 2008, the first LNG carrier arrived at Port Bahia Blanca. The location contract for the LNG regasification project by means of a regasificating vessel, Excelsia, was signed between ENARSA and YPF. In addition, the project consists of a new gas pipeline that connects the ship with the transportation system TGS. According to the newspaper el Clarín, the added cost of importing and regasificating LNG, will cost Argentina between US$12 and 14 per every million BTU, almost double the price paid to Bolivia (previously US$ 6.97 per million BTU, which was increased to US$ 7.8 after renegotiations). In the case of Uruguay, since it has a small economy, it seems as if the project progresses slowly, contrary to that in Brazil and Argentina. The very first plans took place in 2007, however, it did not begin until the year 2009. The kind of terminal that it is hoped to be implemented could share some technological similarities with the Mejillones Plant. It is expected that by 2012, the plant will start operating. With regard to the maximum capacity of the plant, there are still uncertainties. If Uruguay decides to use it for self-supplies, the capacity according to its demands would be of 3  4 Mm3/d. However, if a negotiation agreement is reached with Argentina so that the plant can supply both countries with LNG, its investment and capacity would be greater. Peru's LNG project, of which the main and majority shareholder is Hunt Oil Company18, is exclusively aimed for the development, construction and operation of the Liquefaction Plant of Natural Gas and a new gas pipeline 408 Km long, for natural gas transportation from the Camisea fields to the liquefaction plant. The main destination of the product is Mexico, which wishes to reduce it dependence on the United States and diversify its energy matrix. The plant, which intended on starting its operation by mid 2010, is located in Pampa Melchorita, 169 Km from Lima. It has a cost of US$ 3.9 thousand million (including financing costs), of which the Interamerican Bank is contributing with a direct loan of US$ 400 million. Bolivia has the second largest gas reserves in South America. Its proven reserves, production and consumption increased considerably by the end of the nineties, due to private investments that were developed in the sector. The energy sector, as well as the whole economy of the country, joined the deregulation package. Privatization of the state owned enterprise YPFB in 1994 and low tax rates, motivated transnational enterprises to invest in stages of exploration, production and distribution. The drastic nationalization of hydrocarbons in Bolivia and the breach of some contracts, were in a certain way catalysts that made many countries turn away from the LNG market in the region. With the new regional context that welcomed the commercialization of liquefied gas to ensure its energy supply, Bolivia seems to be at a disadvantage due to its landlocked position, since there is a worldwide LNG market expanding to which it cannot have direct access. Argentina preferred paying almost double for gas it had imported by sea, than renegotiating prices with Bolivia. Brazil has a 10 year contract that will end by year 2019, and which it has no intention to continue, at least for the moment. Nevertheless, according to declarations made by the YPFB President, Carlos Villegas, during the 24th Worldwide Gas Conference, Bolivia would be interested in capturing foreign investments for the development of its gas industry. Substantially, the country intends to invest US$ 11 billion for the expansion of the sector and because of that it is looking for foreign investors. In the same way, the meeting between the Argentinean Minister of Planification and the YPFB President to settle gas pipelines in the North of Argentina together with the possibility of new contracts could be a good sign for both countries. The primordial challenge for Bolivia is investment in exploitation, but overall in exploration to increase its proven reserves. This fundamental step would provide it with international support in order to make new contracts. Legal and trustworthy frameworks with a certain level of encouragement for international companies, could be the keys to renegotiate with neighboring countries. On the internal level, the culmination of the gas pipeline Carrasco-Cochabamba that connects the gas fields of Carrasco and the city of Cochabamba is fundamental to supply energy to the industrial sector. In short, Bolivia has many advantages in spite of its landlocked situation and the new LNG market in South America, because it is located at the center of countries with great consumption capacities and that are willing to negotiate investments in infrastructure if the legal frameworks are trustworthy. However, the urgent challenge that this country faces, is to increase its investment levels in exploration and exploitation. The importance of energy in regional integration proposals is currently very significant given the worldwide context of price fluctuations of petroleum and given the regional context in which main regional players, Brazil and Venezuela, have a preponderant weight in the energy matrix. The development of transnational energy interconnections brought about during the period of market deregulation and that was guided by private interests, did not support a greater integration process widely understood and defined in this work. The failures in elaborating joint energy policies and a transnational legal framework could not regulate energy trade activities. Therefore, during conflicting moments, the lack of supply was made evident as well as the absence of cooperation among countries. It is for this reason that it can be concluded that although there was progress in the infrastructure of the transnational energy network, there were no advances in energy integration at that time. However, different and currently valid energy cooperation initiatives, combined with infrastructural progress, are steps that need to be made the best of, in order to allow such processes to advance. The growing increase of energy demand, the high dependence on fossil fuels and their impact on the environment, are subjects of energy security that require joint solutions. On the one hand, in the last six years the importance of liquefied natural gas in the global energy market has increased. The joining of Russia and Yemen to the market and the immense production of Qatar will increase the supply capacity. On the other hand of demand, the behavior of Japan and the future demand of China, will define its tendency. It is expected that the growing demand will exceed the supply putting pressure on prices. Among the new exporters it is important to note that Trinidad and Tobago exported 8% of the worldwide total production. The regional presence in the LNG market will be increased with Venezuela and Peru joining in. LNG imports by Latin American countries will increase in the next years as well. Regasification plants in Brazil, Chile and Argentina and possibly in Uruguay in the near future will help this growth. Currently the region consumes 0.48% of the total exported LNG. The regasification plants in Brazil are destined mainly to supply electricity power plants. In Chile, the main regasified LNG users from the Mejillones plant would be the mining enterprises in the north: Quinteros plant has the aim of mainly supplying the central region. In the case of Argentina, the high prices paid for LNG (almost double the price paid for imported gas from Bolivia), is a clear example that energy security has elevated costs. After the 24th Gas Conference that took place in Buenos Aires and with indications given by the Bolivian Government of capturing foreign investments, there could however be a new start of renegotiations between both countries. 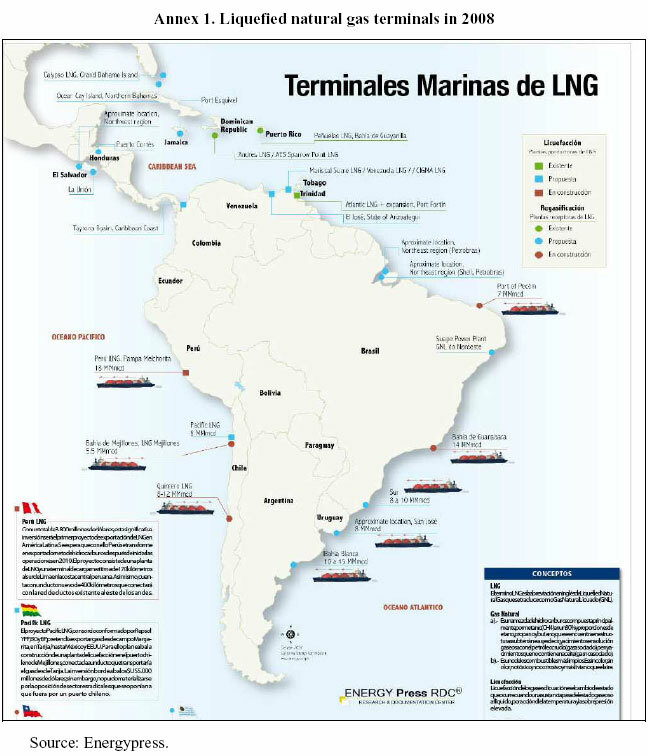 Latin America has been incorporated into the worldwide LNG market in the search for security of energy supply throughout the world. Bolivia, facing this situation and given its geographic location has some disadvantages but at the same time, certain advantages. Its landlocked situation prevents it from accessing the worldwide LNG market directly and to make the best out of the situation in the worldwide context. At the same time, Bolivia has an advantage due to its geographical position because of its proximity to Brazil (tenth biggest energy consumer of the world) and to Argentina which is the biggest natural gas consumer in Central and South America. Although Brazil and Argentina entered the LNG market with the construction of regasification plants, the growing utilization of natural gas in the production of energy power, will make renegotiations possible with Bolivia, if the latter is interested and if it sets out a legal framework that is transparent, trustworthy and predictable. For the moment, the main challenge for Bolivia is to increase its investment of exploration, exploitation and gas production. British Petroleum (2007), BP Statistical Review of World Energy 2007. British Petroleum (2009), BP Statistical Review of World Energy 2009. 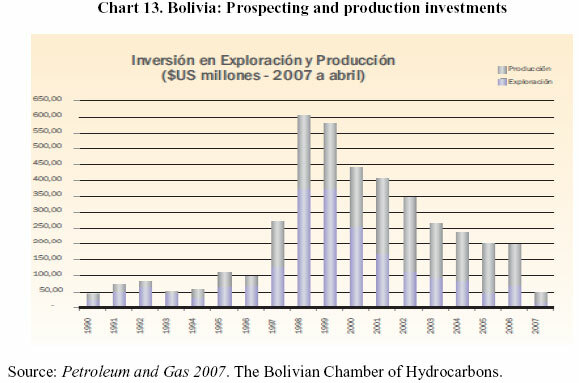 Cámara Boliviana de Hidrocarburos (2007), Revista Petróleo y Gas. Santa Cruz, diciembre de 2007. Cardozo, Elsa (2006), "La gobernabilidad democrática y regional y el papel (des)integrador de la energía". Nueva Sociedad, No. 204. CEPAL (2008), Panorama social en América Latina 2008. Santiago de Chile: CEPAL. Flower, Andy, (2009) "What will be the impact of Qatar's six mega trains on the global market? Presented at the 7th Doha Natural Gas Conference & Exhibition (March). Jensen, James (2004), The Development of a Global LNG Market. Is it likely? If so When? Oxford Institute for Energy Studies. Kozulj, Roberto (2008), Situación y perspectivas del GNL en América del Sur. Serie Recursos naturales e infraestructura. Santiago de Chile: CEPAL (febrero). Linkohr, Rolf (2006), "La política energética latino americana entre el Estado y el Mercado". Nueva Sociedad, No. 204. Muchielli, J-Louis ; Mayer, Thierry (2005. ), "Économie Internationale". Dalloz, Paris. OLADE (2006), Informe Estadístico Energético.  (2007), Sistema de Información Económica Energética, versión 18. Quito (noviembre). Ruiz, Ariela (2006), Cooperación e Integración energética en América Latina y el Caribe. Serie Recursos Naturales e infraestructura. Santiago de Chile: CEPAL (abril).  (2007), La seguridad energética de América Latina y el Caribe en el contexto mundial. Serie Recursos naturales e infraestructura. Santiago de Chile: CEPAL (noviembre). Sánchez, Fernando (2006), América Latina y la búsqueda de un nuevo orden energético mundial. Nueva Sociedad No. 204. Solís de Ovando, Lino y Larraín, Sara (2005), Anillo energético sudamericano. Desafíos de la integración energética del Cono Sur. Fundación Heinrich Böll (diciembre). 1 "Declaration of Commitment of Port of Spain". Fifth Summit of the Americas. Trinidad and Tobago, April 2009. 3 Further on we shall see that the origins of these two types of agreement are in essence different and so are their purposes. 5 The EIA is a section of the US Department of Energy (DOE) providing statistics, data, analysis on resources, supply, production, consumption for all energy sources. 6 Mexico's level of proved reserves represents 6.68% of the total reserves of LAC and 11% of the Venezuelan reserves. 10 Andy Flower Associates, "In the Global Liquefied Natural Gas Market". EIA, 2003, p. 4. 12 Marco Aurélio García, Adviser to the President of Brazil, Lula da Silva, at the meeting of the creation of the South American Energy Council. 13 "The Global Energy Challenge: Review of the strategies for Natural Gas". Presented at the 24th Gas World Conference, October, 2009. 14 "Question for Ghislaine", regarding LNG imports of Chile and its impact on the Latin American energy integration. EIA Program Manager for Latin America. Published by: Business New Americas. Paris, October 23, 2009. 18 Peru LNG has 4 partners: 50% Hunt Oil Co. (operator), 20% SK from South Korea, 20% Repsol-YPF from Spain, 10% Marubani from Japan. 22 YPFB was nationalized on May 1st of 2006, through Supreme Decree No. 28701, "Heroes del Chaco". In the first article it is pointed out that: "The state takes back the property, possession and total and absolute control of these resources".